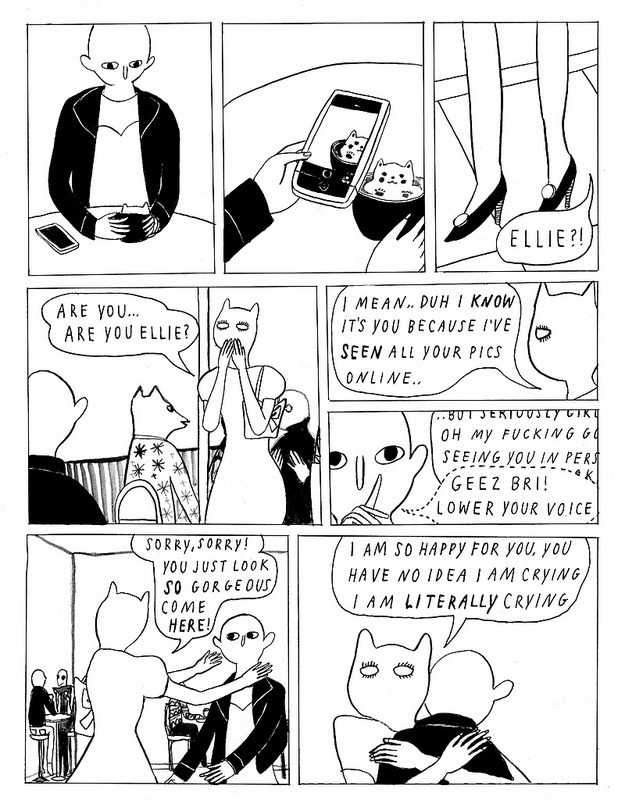 Yumi Sakugawa took the internet by storm in 2012 with the crushingly adorable I Think I’m In Friend-Love With You, now a book from Adam’s Media, and I’ve been following her work recently, especially since her minicomic Never Forgets was nominated for an Ignatz. Sakugawa’s keen eye for isolation in a social media driven modern relationships has been a touchstone for her previous work, but it shows up here in a brand new way. Never Forgets’ main character Ellie has recently undergone dramatic reconstructive plastic surgery. She meets up with a friend/fan Bri who only knows her through her pictures on Instagram. Bri idolizes Ellie for her transformation, fawns over her. Ellie has “carved herself down to her true essence,” but it’s not clear that her friends understand what kind of toll this transformation will exact. Bri’s glazed-over eyes, her uncomprehending stare as Ellie cries on the phone is telling. Importantly, Ellie has had her surgery unbeknownst to her family, and breaks the news in a casual visit to her parent’s house. 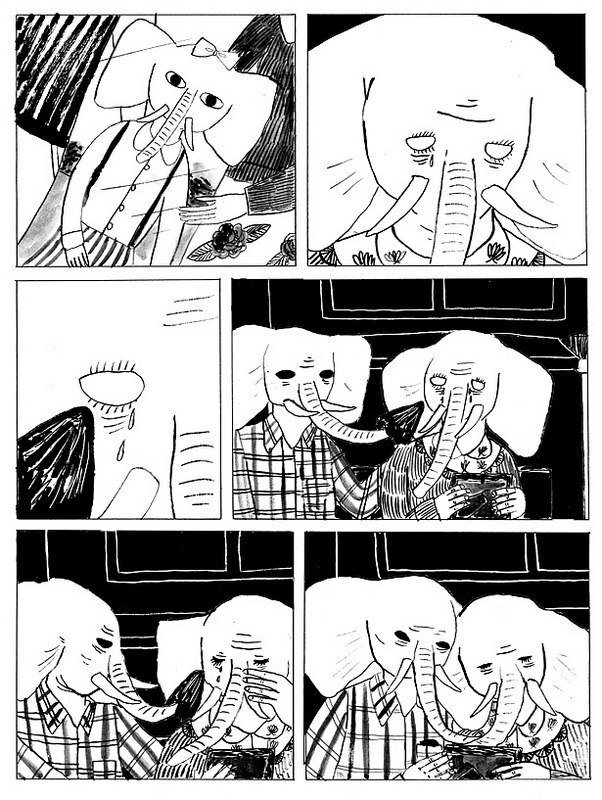 There’s this idea of pre/post that flows through the second half of Never Forgets when we find out that Ellie is an elephant. In a world of animals, this isn’t remarkable in itself, but the difference between what she looks like now and what she looked like before the surgery is striking. 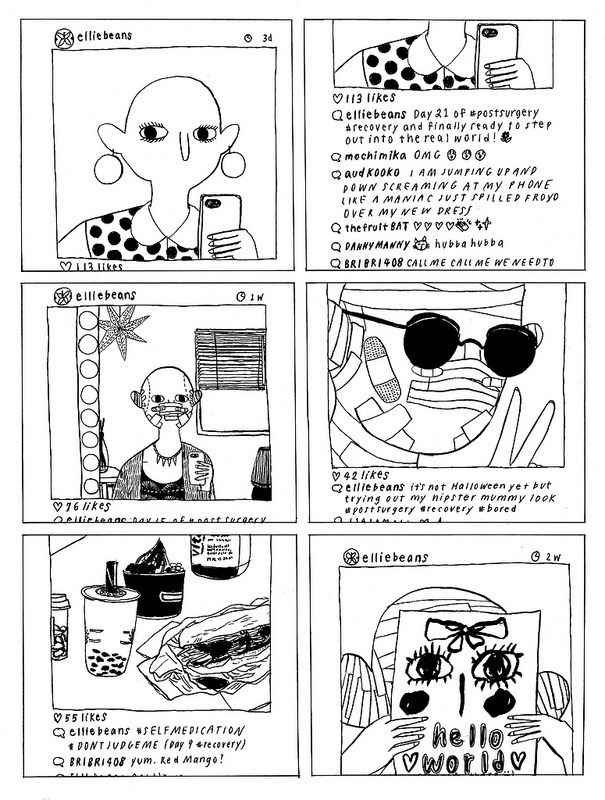 Throughout Never Forgets,Sakugawa explores the disconnectedness of social media and how we crave attention. We see Ellie buy a coffee with a cute cat whipped topping which she’s sure to take a picture of but not to drink. Read closely, there’s mostly positive conversation on Ellie’s Instagram feed, but one “devil’s advocate” asks if she’s making the change because of social pressures from years of damaging media. It’s a reminder of the pervasive and destructive social norms that haunt us, that tell us we aren’t worthwhile, that we are never good enough. And that’s the sticking point. At the end of the comic, Ellie is hurt. Her parents are hurt. The silence is deafening. But Instagram can’t know and doesn’t care. It’s a cold reality. We are broken, breaking, and all too willing to find solace in a crowd that can tell us who we are, but can never actually know. Recommended. Yumi Sakugawa is an illustrator and comics creator based in Southern California. She blogs at acrosstheyumiverse. You can purchase her work from her website here. 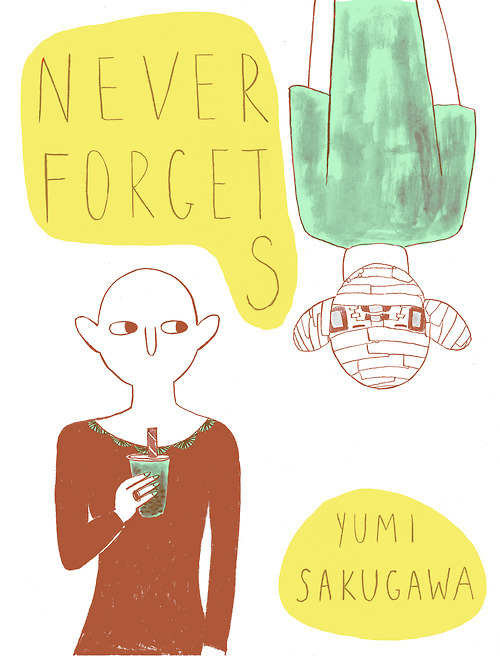 Never Forgets has been nominated for the spx 2014 Ignatz “Best Minicomic” category. You can see all of the nominees at their website and vote for your favorite comics this weekend at the expo.